Have coffee or an espresso at the Kracker Barrel if you get here before check-in time, or take a walk/drive to a scenic vista nearby. Bring a Bathrobe, Steaks & Veggies to grill, and your favorite, locally roasted, pre-ground coffee and a cooler full of ice cubes for mixed drinks. Try out a Hello Fresh or other grocery service meal, cook it as an evening activity in your condo's kitchenette. Arriving after 8pm? Ask about after hours check-in. Best Burger: Blue Spruce Tavern in Packwood. Favorite scenic road trip: See the Fall Larch season in all its splendor! 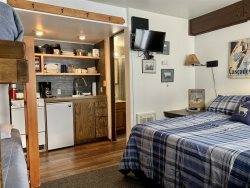 The Village Inn is in a prime location to stay while visiting the great mountains of the WA South Cascades region, within a 20 minute to 2 hour drive of the three juggernauts. Odds are good you've heard of Mount Rainier & Mount St. Helens, and have seen Mount Adams from afar. On the west ridge of Paradise Basin, there is a vista where you can see Mt. Rainier and the neighboring ridges and mountains. Or, if you're out for a multi-day backpacking trip there is a spot in the Goat Rocks (a semi-secret location just south of here) where you can camp and see Rainier, Helens and Adams on a clear day. For a morning drive, head up to Camp Muir to see glaciers in their glory and possibly do some early or late season skiing or prime season hiking. Curious about volcanoes? The Mount St. Helens visitor center is an incredible day trip for families year-round. History and science combine into a recently formed, accessible natural wonderland. Best time to visit is mid-summer.